The evictions didn’t provide a solution to the land problems in Bodyke. An agreement on rent was reached, whereby about one third of arrears was paid and abatements were granted on judicial rents. But in November 1891 Colonel O’Callaghan, in financial difficulties, stopped the abatements. 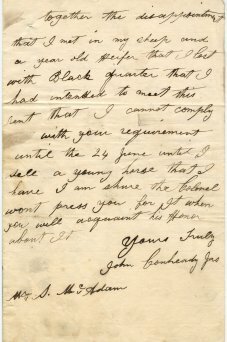 By 1892 many tenants had difficulty in paying rents, and had fallen into arrears. asking for more time to pay his rent. Rent is paid, but has to be borrowed. Colonel O’Callaghan had decided on a ‘distress policy’ i.e. 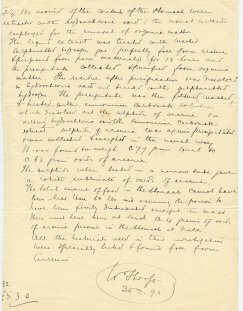 the seizure of goods and livestock in lieu of rent. Special bailiffs were appointed to carry out the distress but they frequently met with violence. 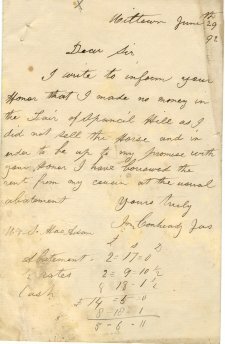 Having duly distrained the chattels of the tenant, the bailiffs proceeded to sell the chattels (usually livestock) at public auctions. though his actual rack rent was £48.10.0. In an effort to thwart the bailiffs in seizing the correct animals, the tenants would switch livestock on their respective holdings, often leading to the wrongful seizure of an animal. 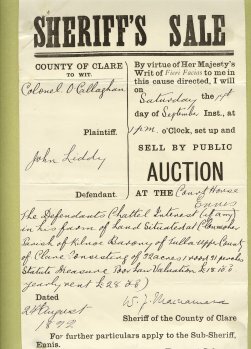 Colonel O'Callaghan was sued by some of his tenants for damages resulting from the wrongful seizure of farm animals by his agents. seizure of Darby Tuohy’s livestock. 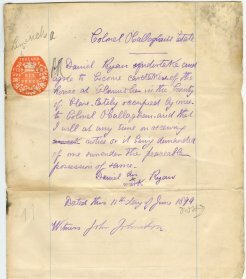 In November 1893 Colonel O’Callaghan evicted eight tenants for non-payment of rent and caretakers were installed to prevent reoccupation. In Spring of the following year, the landlord’s cattle were put to graze on the evicted farms. 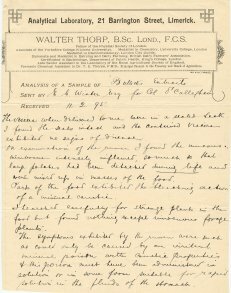 A series of cattle poisonings took place in Clonmoher during the summer and early winter of 1894. 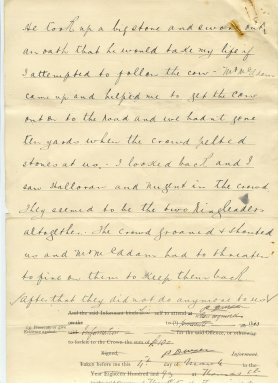 Colonel O'Callaghan's son, Captain George O'Callaghan, has left us this graphic account of the scene at Clonmoher: "On Tuesday the 3rd [July 1894], the place presented a deplorable appearance. Eleven beasts lay dead and dying. The dead carcasses were greatly swollen, and the torn appearance of the sward around showed how the unfortunate animals had suffered. One still alive had in its agony dragged itself down a hill and lay dying in a ditch into which it had fallen." 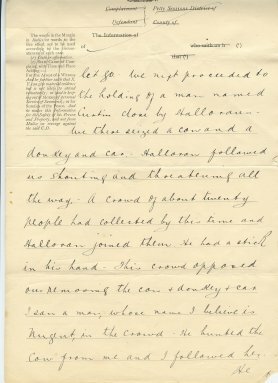 In all, a total of sixteen cattle died under strange circumstances at Clonmoher. 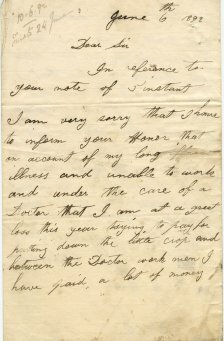 examination to be due to arsenic poisoning. 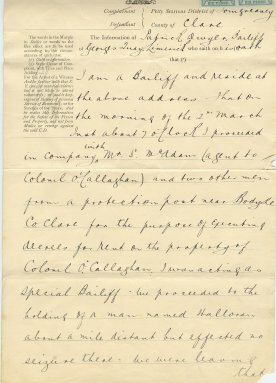 The Land Acts of the first decade of the 20th century enabled tenants to buy out their holdings, but negotiations between the Bodyke tenants and Colonel O’Callaghan broke down. 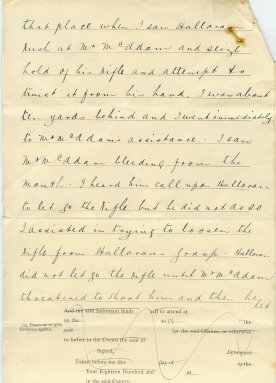 In 1909 the Land Commission acquired the Bodyke section of the O’Callaghan estate compulsorily and tenants eventually purchased their farms. 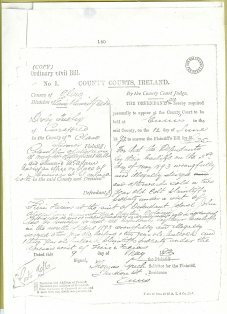 The proposal of tenant ownership, put to the meeting in Scariff in 1880 by Fr Murphy, had become a reality. Its implementation, however, signalled the end of the Big House and the landed estate in Ireland.